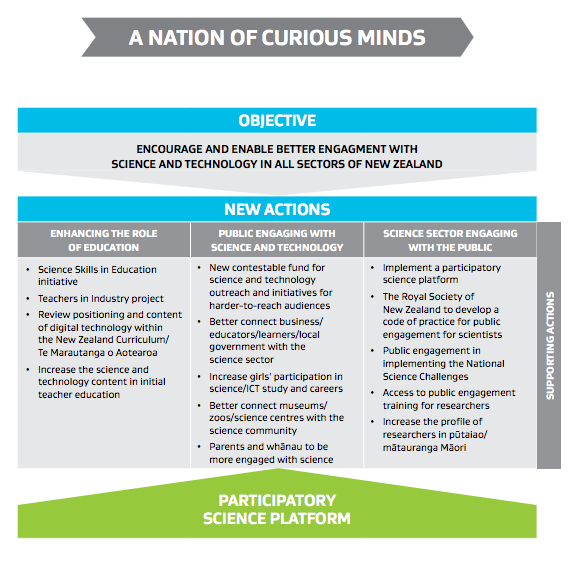 Yesterday saw the much-anticipated release of the Government’s National Strategic Plan for Science in Society, which lays out a series of activities and priority areas for better engaging New Zealanders with science. I was part of an expert working group that MBIE consulted, a group that was mainly made up of education experts, which indicates the strategy’s core focus – children and their relationship with science or the so-called STEM subjects (science, technology, education and mathematics). That isn’t my area of expertise, so it was fascinating to listen to the experts debate the best way to get kids interested in those types of subjects in the hope that they will become the “curious minds” we need to do creative things later in life. My job was to give input about engaging the public, particularly via the media, which is still the main channel where people get information about science – though increasingly new media and social media are the first port of call. The Science Media Centre gets a mention in the report which I’m happy about. We’ve got some big plans for later this year which the Government, our funder, thankfully likes the sound of. But here is what I told Sir Peter Gluckman and the rest of the panel – the media’s appetite for science is actually very good – as long as the science is presented in a compelling way and fronted by confident and media savvy scientists. If we want better coverage of science by the media and therefore better understanding of the big science related issues by the public, the science sector needs to improve its game. Too many big science-related issues come up that, for a multitude of reasons, aren’t well articulated by the scientists that are best positioned to explain them. Too many times we at the Science Media Centre are left scrambling around trying to find people to talk to the media on issues that are of vital importance to society, the environment and the economy. So what I’ve been telling the Government is that the media will do better science coverage, when science does better media. That means scientists need the support and encouragement of their institutions to speak out, to engage in science communication. They need to be incentivised – and required to do so, as happens in the US and Australia, where taxpayer-funded grants often come with science communication requirements and incentives. We need to see a culture change in our universities and CRIs where the efforts of scientists to communicate their work and have input on the big issues when society most needs it, are recognised to a greater extent. They need training and access to resources. There needs to be recognition of the fact that scientists may spend less time in the lab but more time making TV shows, leading citizen science projects and fronting to the media on controversial science subjects. Institutions need to set clear guidelines so that scientists who are engaged in commercial work, but are also funded by the taxpayer, are free to speak about the fundamental science they are working on. I speak to too many scientists who are being told that being a scientist and a science communicator are not mutually compatible – that their career progression depends solely on the papers they publish, the science they do. Excellence in science will always be key, but the acceptance of that science by society and therefore the funding of it, depends on the ability of the science sector to engage the public in it. The SMC’s submission to the PBRF Review outlined exactly that argument and called for greater recognition of non-academic outputs, such as science communication. I’m pleased to see that the strategy actually does address a lot of these things. – It calls for the Royal Society of New Zealand to develop a code of practice for public engagement for scientists. This should clarify the expectations on scientists and the rights and freedom they have to talk about their science. – It allows for access to public engagement training for researchers – the sort of support and up-skilling that will allow scientists to more confidently communicate their science. – A key aspect is the development of a participatory science platform – think a network of citizen science projects and tools that engage kids, their families and communities and scientists. – There will be a contestable fund for outreach activities, particularly for hard-to-reach audiences. – Initiatives to increase the profile of Maori researchers and their work. I’m happy to see all of those planned activities. The devil is in the detail, obviously. To what extent, for instance, will they result in the culture change in scientific institutions that promotes the type of science communication I outline above? Fluffy language in a National Science Challenge contract about “efforts to communicate the science” won’t necessarily cut it. And the big question – how much funding will there be for all these activities? The participatory science platform in particular will not be cheap to do properly. Until we know the answers to those questions, its hard to know how effective the strategy will be. But what we have here is similar to strategies overseas, such as the Inspiring Australia initiative which had some really good aspects to it. Every country is trying to figure how to better engage society with science. This is a pretty good plan, the details of which will hopefully clarify how much resource will be available and the requirements placed on the funded parties. At page 8 of A Nation of Curious Minds & I’m in despair re the crap writing. Let’s not let science literacy to come at the cost of literacy. I hope to see some dedicated money to fund the time it takes to do #science #outreach #scicomm for the scientists themselves. True, solid and fact based science is what we need more of and what we need society and government to take more note of, sadly we get less of it, apart from headlines. Even some scientists are not assisting, even Chief Science Advisor Dr Gluckman has not clarified positions, while he is advising the PM and government. Society deserves to be concerned about a government blindly trusting and relying on scientific research, presented by a professor Mansel Aylward, who was once for years paid and “sponsored” by a private corporate insurance giant called UNUM Provident, to conduct and prepare research, which clearly delivers questionable results that is used and potentially abused now by governments, insurance companies and ACC to dis-entitle sick and disabled from benefits. This is an area of “research” and “science” needing clarification and justification, as what I and others have read and studied raises more questions than answers. Society will not be encouraged by such “science”, I am afraid. The “E” in STEM stands for “Engineering”. Although the engagement between scientists and general public needs to be strongly encouraged, improved, funded, and expanded in New Zealand I am quite wary of what different people seem to understand by this. Even in the peer-reviewed scientific literature there seems to be more BS filtering through in the form of incorrect facts, misinterpretations, speculative opinions, wishful thinking, etc. Since engagement with the media goes through a much less rigorous process there is a much higher risk of overstatements, hyperboles, speculative opinion, pushing of wheelbarrows (i.e. personal agendas), etc., which have nothing to do with evidence-based scientific research and the scientific process. IMO the engagement should not be limited to nor focused on blowing one’s trumpet with ground-breaking research, success stories, and narcissistic attention seeking in addition to ticking a box for PBRF. Perhaps I am a wee bit too harsh and cynical – cantankerous even?